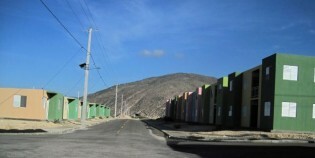 Named after a famous Haitian singer, the Lumane Casimir Village sits in the desert-like plain at the foot of Morne à Cabri and will eventually have 3,000 rental units. About 1,300 are now ready. Four years after the Jan. 12, 2010 earthquake, questions continue to haunt the four main post-disaster housing projects built by the Haitian government. Reforestation and soil conservation programmes costing many thousands of dollars in this rural community have resulted in hundreds of small ledges built of straw or sacks of earth. In certain areas, the earthworks seem to be lasting, but in others, they are disintegrating. Haiti has been receiving food aid for half a century - over 1.5 million tonnes from the U.S. alone during the past two decades. Pink, green, blue, red. From a distance, the thousands of brightly coloured houses look like a painting. The observer can’t see the suffering and dangers threatening the residents of the Jalousie neighbourhood – problems that are being ignored by the government, which is spending six million dollars on a massive make-up job. Despite two government decrees making their import and usage illegal, styrofoam cups and plates are used and littered all over the capital, as well as bought and sold, wholesale and retail, completely out in the open. Three years after its star-studded launch by President René Préval, actor Sean Penn and other Haitian and foreign dignitaries, the model “Corail-Cesselesse” camp for Haiti's 2010 earthquake victims has helped give birth to what might become the country's most expansive – and most expensive – slum. Despite the unforgiving sun and its sweltering heat, Joel Monfiston is working, hammering a piece of worn plywood, watering flowers and picking the weeds out from between rocks and pebbles. Ever since his election in 2011, Haitian President Michel Martelly has touted his "free school" program as one of the government's major accomplishments. "A victory for students!" banners and posters boast. "I get everything at the Haiti-Dominican Republic: carrots, squash, eggplant, cabbage, peppers, eggs, salami," explained a merchant at the Croix des Bossales marketplace, her stand teeming with goods. "The border is what feeds us." A World Bank-funded community development project in Haiti appears to have inadvertantly harmed or even dissolved some of the grassroots organisations it was designed to strengthen. A 61-million-dollar, eight-year community development project funded by the World Bank and executed by the Haitian government and two international development agencies has raised questions of waste and corruption, and even carried out what could be called “social and political re-engineering". Even though a restrictive government decree that blocked reconstruction of downtown Port-au-Prince for almost two years was finally annulled, questions, frustrations and doubts abound about the eventual recovery of Haiti’s economic, cultural and political capital. Just months after the Jan. 12, 2010, earthquake killed over 200,000 Haitians and drove another 1.3 million into squalid camps, the Building Back Better Communities (BBBC) project got the green light from the Interim Haiti Reconstruction Commission (IHRC), headed by former U.S. president Bill Clinton and then-Haitian prime minister Jean Max Bellerive. The smells and scenes that greet a visitor to this eerily empty collection of over 60 brightly painted homes and buildings verge on the obscene. Twenty billion dollars worth of gold, copper and silver hidden in the hills of the hemisphere's poorest country. Investors in North America so convinced of the buried treasure, they have already spent 30 million dollars collecting samples, digging, building mining roads and doing aerial surveys. With heads of state from more than 120 nations and tens of thousands of civil society and international development experts gathering for the U.N. Summit on Sustainable Development next week, it is accepted wisdom that rethinking agriculture is one of most critical issues facing this and future generations. TAJIKISTAN: Could Showdown With Popular Cleric Backfire? With a court order to close one of Tajikistan's most popular mosques, President Imomali Rahmon's administration is stepping up its campaign to neutralise both Islam and the last vestiges of any political opposition. More than 100 Haitian families now have new housing, thanks to the support of two non-governmental organisations working on reconstruction following the country's devastating 2010 earthquake.